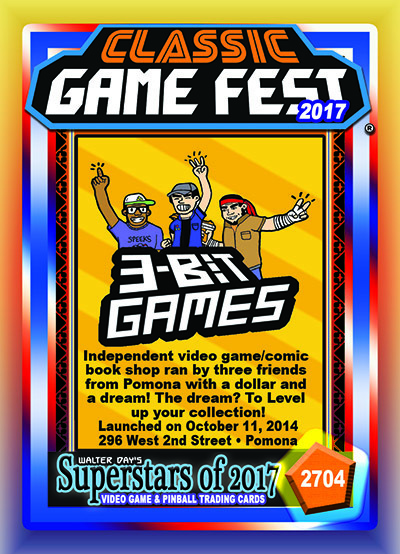 To honor 3-Bit Gaming for their important contributions to the gaming culture, this trading card and award were preesnted at the Classic Game Fest Trading Card Awards Ceremonies, July 29, 2017, in Austin, Texas. 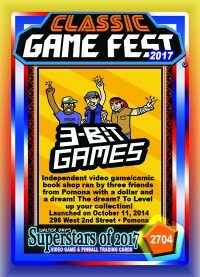 Fueled by the burning desire to somehow make money and hang out with their friends at the same time, three friends from Pomona brought 3-Bit Games to life in 2014. They like to compare their daily existence to the plot seen in the movie Clerks? 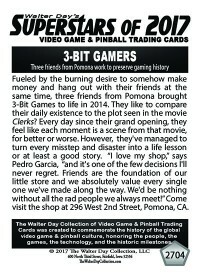 Every day since their grand opening, they feel like each moment is a scene from that movie, for better or worse. However, they've managed to turn every misstep and disaster into a life lesson or at least a good story. 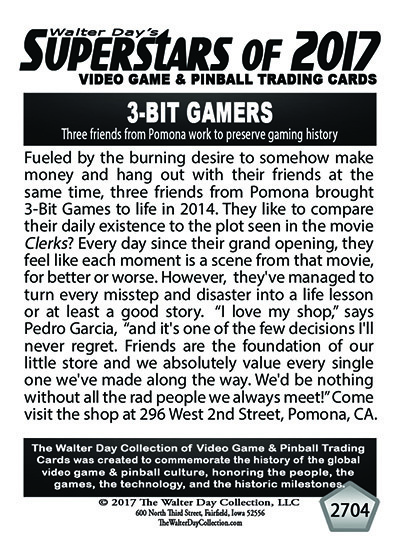 “I love my shop,” says Pedro Garcia, “and it's one of the few decisions I'll never regret. Friends are the foundation of our little store and we absolutely value every single one we've made along the way. We'd be nothing without all the rad people we always meet!” Come visit the shop at 296 West 2nd Street, Pomona, CA.